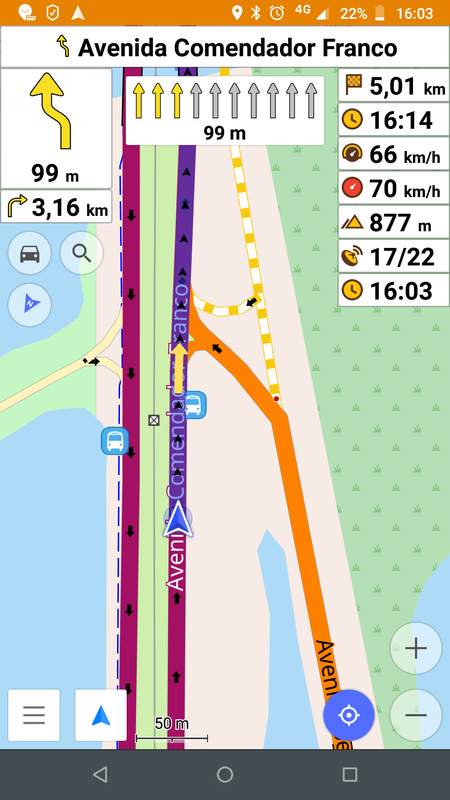 I've inserted every [turn:lanes] info that I know in one important highway which I use daily, but when I saw it on OsmAnd (I've got OsmAnd Live and have hourly updates) the lanes weren't exactely the way I've putted in on OSM. I'd like help to know what's possible wrong there and what needs to be corrected before I start to insert [turn:lanes] info into more roads of my city. This looks like it might be a reoccurance of an old OsmAnd bug. Does disabling and then re-enabling the live updates for that region fix the issue? Yes, does indeed look like this bug. However this bug has been fixed and I didn't saw it again after the fix. Weird. @viimoraees it looks like you are using JOSM. JOSM has a really nice paint style called "Lane and road attributes". It works really well and use it all the time when adding lanes and turn lanes. You will immediately see your changes, before uploading. @InsertUser Is exactly this bug! Disabling and re-enabling the live updates didn't fix it :( first I thought that was something wrong I've done in editing, but luckily it's not my fault. @scai I do use this paint style! It does help a lot when mapping the lanes. @viimoraees from the bug thread; the issue may be due to conflicting live updates. Turning off and re-enabling all updates doesn't purge the old files, it just prevents further updates. On my device, opening the country specific listing and turning off the Live update for that region warns that the update files will be deleted. I think this is what you want as it will remove the conflict. When you re-add the region to the list of regions that get updates it should then only download the latest version (and hopefully clear the bug).